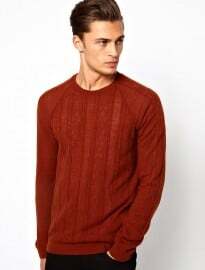 In a world where the majority of men have black, blue, grey and white ingrained in their minds as the only colours that exist for clothes, understated hues like burnt orange and burgundy offer us the chance to stand out from the crowd in a subtle and refined way. We’ve been talking about orange for a while here at FashionBeans; Alex reported it as a key SS13 colour trend back in March and Matt recently included it as one of his personal AW13 menswear picks, so it was only a matter of time before we took a look at how the trend has developed for the upcoming colder months. For me, autumn/winter is by far the easiest time of the year to begin adding colour to your wardrobe. The tones are richer yet more muted, the blend between individual shades is much softer and the darker colours we traditionally associate with the season help to restrain bolder hues and keep them under control. Textures also come into play. Over the past few months I’ve gained a real appreciation of just how much texture impacts the aesthetic of an outfit. Varying weight wools, different weaves and alternative fabrics can dramatically alter the way an item looks and wears, and when it comes to colour it can add a whole new dimension to a look or help to tame the shade. 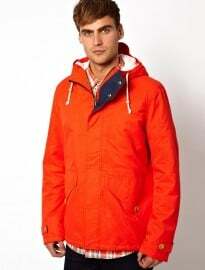 Introducing orange outerwear into your wardrobe can be difficult. For example, even the most confident dresser would be hard pressed to pull off an orange overcoat. Even if you think you could, outside of the most fashionable cities in your respective country, you might find that it attracts more than a little unwanted attention. But don’t let that discourage you. Orange coats and jackets can be a fantastic addition to your repertoire, especially if you already have your timeless basics down – leather biker, pea coat, beige mac/overcoat, indigo denim jacket etc. – and are looking for a signature statement piece this season. For those wanting to take the plunge, try to avoid formal styles. Juxtaposing a bold orange overcoat with your suiting is most likely a step too far and has the potential to appear unprofessional. I’m all for pushing boundaries, but I also realise there is a limit. Stick to casual silhouettes and consider investing in an orange fisherman’s jacket, Harrington/bomber or lightweight parka. These styles are perfect because the bright colour works with the aesthetic you’re trying to produce; fisherman’s jackets are traditionally bright, it’s more acceptable to wear a parka in a bolder tone and a Harrington or bomber jacket shows an appreciation of current trends. These jackets are also perfect for the transitional season as many are unlined and lightweight, yet they remain wind and shower proof. However, this isn’t to say that you shouldn’t look into other styles – orange pea coats, denim jackets and workerwear-inspired versions can work just as well when you make them the focal point of your look and wear with plenty of confidence. In terms of how to wear, just make sure use your jacket as the main statement piece within your outfit and let the colour really shine. Knitwear offers an effortless way of adding colour to your style because you can neutralise it with outerwear or a blazer – choosing to show as much or as little as you are comfortable with. You can also easily frame it with under layers and anchor it with neutral trousers/jeans. One of my go-to looks at the moment combines dark indigo denim, chukka boots and the blood orange knit from Reiss below with my navy bomber jacket (and in future my navy pea coat). Remember that there are varying tones of orange (as there are with all colours) – from dark burnt hues to the brightest of neon – so it’s important consider the entire spectrum. The darker end is going to be much easier to work into your existing wardrobe, is a more refined and understated choice, and will suit the winter colour palette better, so it’s worth starting there. As you become more confident you can graduate on to brighter and/or stronger tones that are designed to make you stand out. When it comes to tops, introduce orange slowly. Start by looking for pieces that use orange as an accent colour – whether that be in a pattern, stripe or even tie-dye. From there you can begin to layer block-coloured orange Henley tops and standard tees underneath a denim or flannel shirt to give your outfits a shot of life. Shirts require more consideration. I wouldn’t suggest you go searching for a solid orange formal shirt as the colour would be extremely difficult to neutralise, even for those who are adept at colour matching. They are not particularly boardroom appropriate either. Instead, follow a similar approach to tees: find shirts with orange as an accent colour (in gingham checks, stripes, polka dots etc.) and it will be much easier to work with. When it comes to casual wear, you can’t go wrong with an old school flannel check – especially if the base tone is something in a more restrained purple, olive green or navy. In my opinion, after outerwear, trousers are perhaps the hardest way to incorporate colour into your style. It might be our continued reliance on jeans and dark chinos that does it, but we all seem programmed to shy away from coloured trousers. As a gender we’re definitely coming round to the idea, but they are still a huge leap for some. For this reason alone, orange trousers are a great addition to any style-conscious gent’s wardrobe; wearing, and pulling off, something that a large majority wouldn’t even consider is a sure-fire statement of individuality and will instantly mark you out as a confident male. Again, use coloured trousers as your statement piece – don’t try to colour match or pair with other similarly bold pieces. Let your trousers take centre stage and keep the rest of your outfit neutral and restrained. In terms of texture, consider heavyweight versions in corduroy, wool or even tweed if you can find them. Pair with worker boots, chunky grey knitwear, a classic blue Oxford shirt and your trusty pea coat for a simple, rugged and masculine ensemble that showcases your fashion credentials. Accessories are by far the easiest way to work bold colours into your wardrobe. They don’t make as much of an impact when considering the look as a whole, but a flash of bright colour injects a sense of individuality and suggests a playful side that your outfit might otherwise not show. Don’t be afraid of orange socks, pocket squares, belts or scarves. These are easy to incorporate into any of your existing looks and can be used as a focal point or to tie an outfit together. Alternative accessories include orange watches, wallets and even phone cases. All these items are very rarely on show, so they can make an even bigger impact when you pull them out of your pocket – and as we all know, it’s the most surprising or unexpected things that often stick in the mind. Autumn/winter colours present us with a fantastic opportunity to refresh and update our style, but only if we’re willing to take it. Many men are still reluctant to branch out from the safe, timeless neutrals they are comfortable with, and it’s a real shame when the rich palette of the colder months is so easy to integrate into your existing wardrobe. Orange is a refined and sophisticated hue that is also surprisingly versatile, so look past white, black, grey and blue and embrace something a little different this year. Are you a fan of orange? Will you be taking the plunge this year? What is your go-to autumn/winter palette? Are there any other alternative colours you think are easier to work with?